Q: Let’s say you became a celebrity overnight (I’m talking a humdinger of an A-lister here) – the type that would be seen on red carpets everywhere – would you get yourself a stylist? I can’t even remember what thought train I was on this week for me to come up with this question in my head, but it’s one of those random things I was pondering. Now it’s purely a question just for fun because there’s very little chance that you can become an A-lister overnight. You can win the lottery, or go viral with something on YouTube, or make headlines for something you’ve done on some reality TV show you’ve made it onto, but 99 times out of 100 those are the 15 Minutes of Fame types. Most “overnight” A-list celebrities have been working for years to become an overnight sensation. Would YOU hire a stylist? So just for fun, purely hypothetically speaking: Would you hire a stylist? After all, you’re an A-list celeb and money is no object. 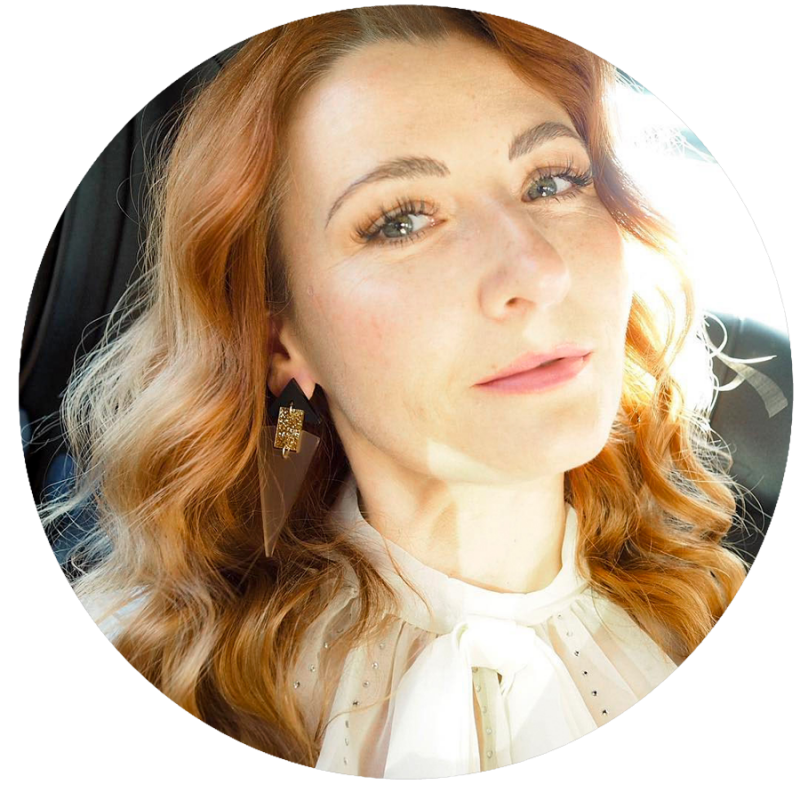 I know you lot are a confident bunch (I won’t say “stylish” because everyone’s definition of stylish is different) so you may think No, I’m a grown up woman and am happy with what I wear, thank you very much – I don’t need a stylist, famous or not! Or you may think Well it might be fun to have someone who takes the pressure off what I wear to events and can advise me on what designers and brands that I may not be aware of. Are you wondering which way I’d go? BLAKE LIVELY FAMOUSLY DOESN’T HAVE A STYLIST. I SEEM TO REMEMBER READING THAT DIANE KRUGER DOESN’T EITHER. BOTH OF THESE WOMEN ARE ACHINGLY STYLISH. Blake Lively famously doesn’t have a stylist. I seem to remember reading that Diane Kruger doesn’t either. Both of these women are achingly stylish, and I don’t ever remember either of them being included in those heinous “What was she thinking?” articles in magazines. From my point of view I think being under the scrutiny of the media is a TERRIFYING prospect. Plus now you have social media which is a forum for everyone in the whole world to have an opinion on what you’re wearing, and not only that but they can tell you directly with tweets and =ahem= wonderful Instagram comments that talk about you in the third person. 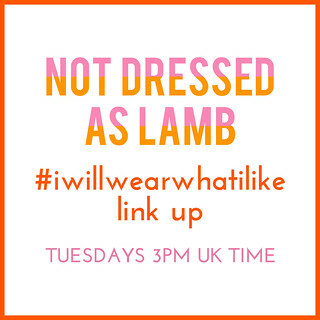 So bloggers and influencers do get it to a greater or lesser degree, depending on the size of their following, but as you know I’m a believer in #iwillwearwhatilike. Famous or not, I wouldn’t wear anything that I didn’t like, feel comfortable in or that just didn’t look like me… I’d want to still look like ME. That said, it may surprise you to know that I WOULD actually get a stylist, at least at first. I quite like the idea of someone giving me advice not necessarily on WHAT to wear, but WHO to wear. (And I say advice… I’m thinking more “suggestions”.) Although I’m no stranger to the collections of Gucci, Rodarte or Erdem, I’m certainly no expert on designers and everything that comes out every season. I’d love to have someone who can suggest designers to me that I may blissfully be unaware of, but I’d still effectively want to ultimately style myself. So I’d have someone who was more of an advisor rather than a stylist. Help and advise me yes – actually style me… no. I’d bet Carrie Bradshaw would do the same, no…? IF YOU BECAME A BONA FIDE CELEBRITY OVERNIGHT, WOULD YOU GET YOURSELF A STYLIST? OR WOULD YOU STILL STYLE YOURSELF, CRITICS BE DAMNED? 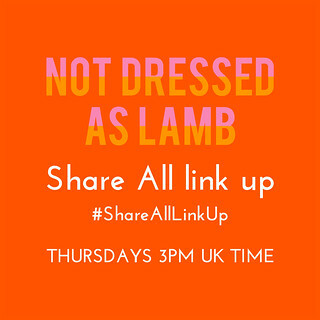 Just quickly, before the link up – a favour to ask! 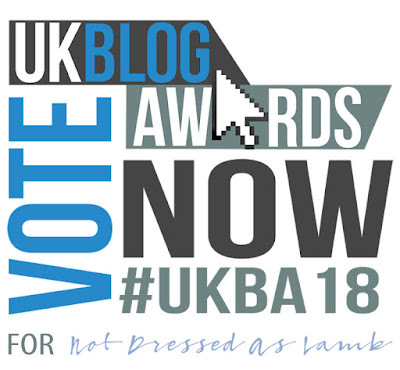 Could you spare about 30 seconds to vote for me in the UK Blog Awards please…? 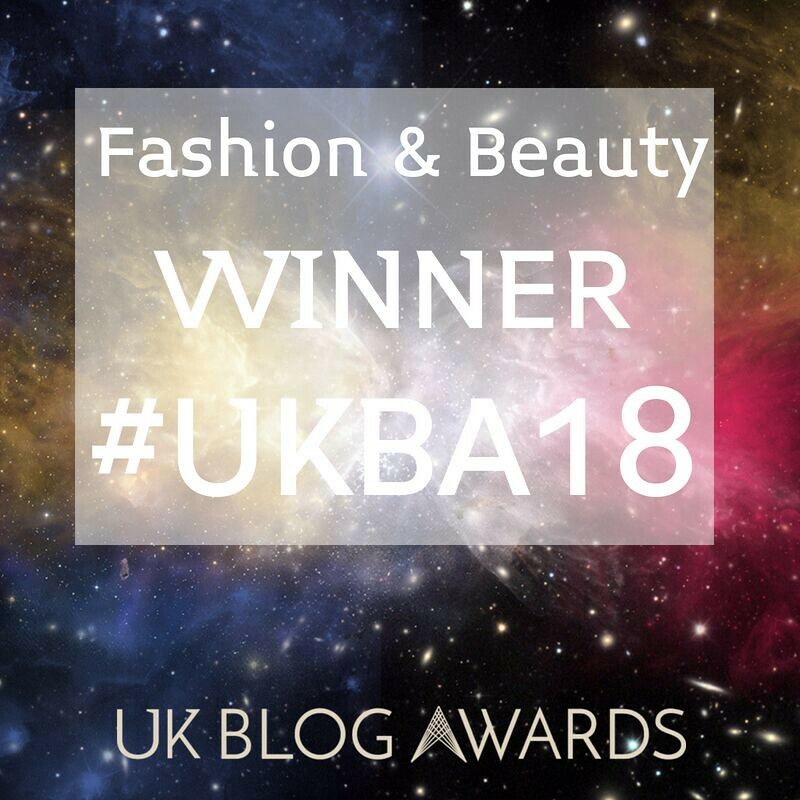 I’ve decided to try for a fourth nomination in a row at the UK Blog Awards in 2018 – would you be good enough to vote for me please? Full details in my post about why I’m entering again here or go straight to the voting page (use every email address you have)! Thank you sooooooo much…! I'd love to meet up with a stylist to get her (or his!) point of view and some ideas but I wouldn't want to use them all the time. I think being in the public eye would probably make me more daring anyway – and that'd be part of the fun, right? Love this post, Catherine! Oh goodness, no! I don't react well to being told what to do at the best of times, and certainly not when it comes to what I wear. Besides, I get so much fun from putting outfits together! Like you, I'd probably appreciate someone introducing me to new brands, or finding fabulous items in my preferred style that I might have overlooked, but I would definitely have the final say. Also, I find that celebrities all tend to look very generic, and the styles they wear aren't those that suit me. Never. Thanks for hosting and thanks for hosting. I'm a naturally delusional person. And so, I ponder this question at least three times a week. I'm not kidding! I also have priorities. I definitely would not want a stylist because I know what I love and what looks great on me. Now–instead of a stylist, I would want THE best plastic surgeon in the world that money could buy (but not my money because I am a paupered princess). This surgeon would pull and stitch all the wrinkles in my turkey neck and pull and stitch my jowls and all wrinkles so high that my face would be as smooth as a newborn's bottom. Only I would still look like me–but better!! Catherine Lartigue not Urbanski, I can't seem to correct this damned google garbage. Hmm, maybe a personal shopper rather than a stylist, as I like the idea of being introduced to new brands/styles but would probably not cope well with someone telling me what to wear!! The tulee dress is calling my name. Perfect for a Viennese Waltz. I think your way is the best of both worlds, and i’d like that too. An advisor would introduce new ideas and new designers, and her suggestions would enhance you rather than take you over. And, as an A lister, think of the time you’d save! I like your advisor idea, I'd still want to keep my style, but I'd love suggestions, and maybe someone to push me slightly out of my comfort zone once in a while (emphasis on the 'slightly'). And someone to do my eyeliner would be great too, just haven't got the patience to learn properly. I'd do the rest of course, but a little help with the details would be great! Catherine, you are so cute. What a fun question to pose! I think I am with you on the idea of an Advisor-Stylist. I also like the way I style myself and am perfectly capable of putting together an ensemble that works for me. But knowing who to wear and where to find those specific items that I get set in my head that I absolutely need, that would be helpful to have someone in the know! A hair stylist though…I might get one of those…to put curls in my hair whenever I am feeling like I want to be all bouncy! Super fun post! Have a great weekend. I'd love a stylist and the makeup and the hair – and then I'd ruin it all by saying it didn't feel like me and changing it all around! The makeup would be too heavy, the hair wouldn't be quite the right shape and the dress would be the wrong color! Oh dear, that's it then, no stylist would touch me with a barge pole! I'd definitely want some advice, but I'm not really sure what I'd do. That dress is simply dreamy. Happy Friday!!! Oh how exciting. I think I would hire a stylist! And let my hair and makeup done! But whatever you decide, I'm sure you will look stunning! It's an interesting thought Catherine!! And I have a feeling I'd be like you—I'd love to see what it'd mean to have someone else style me. I know for sure, I'd have someone be doing my hair and makeup—-that would be a great splurge!!! I stopped to ponder the question before reading on to find out your answer, and mine was much the same! I would love someone to advise and scout for me, but not "style" me per se. With so many new designers and lines coming and going each year, it would be nice to have someone to stay on top of that part of the biz!